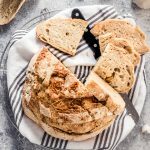 Studded with cloves of garlic and a swirl of grated parmesan, this bread couldn’t be more flavorful—or easier to make! The no-knead technique gives you a tender, crusty loaf with a fraction of the work, making this the perfect accompaniment to a weeknight dinner. No-Knead Garlic Parmesan Bread is studded with cloves of garlic and a swirl of grated parmesan. This bread couldn’t be more flavorful—or easier to make! The no-knead technique gives you a tender, crusty loaf with a fraction of the work. This loaf is the perfect accompaniment to a weeknight dinner. I love making bread. There’s something almost mystical and magical about taking the simplest of ingredients, then allowing time and technique to create something that’s both an art and a form of sustenance that mankind has relied on for thousands of years. But as much as I love the time-honored traditions of wild fermentation that leads to things like sourdough, or the overnight rests that result in the famous European varieties, and the magic that is kneading a few pounds of dough, I have to be honest. I don’t usually have that kind of time. Enter recipes like this no-knead garlic parmesan bread. It requires about 10 minutes of mixing and ten minutes of shaping and still delivers on flavor and texture. How can you not be obsesssed? And while the method is crazy simple, adding in the garlic and parm makes it a little bit fancier, you know? Like you are some bread-making demi-god without even breaking a sweat. The garlic roast into soft, creamy little bursts of flavor studded throughout the loaf. The parmesan is a subtle little hint of flavor. You could up the amounts of either if you like, and it wouldn’t hurt a thing. In fact, I say the more the merrier! If you aren’t going to be home 3 hours before baking, you can make the dough up to 24 hours ahead. Let it rise for an hour, then cover the bowl with plastic wrap and refrigerate it until about an hour before shaping and baking. So many options to make it work for you! 1/2 cup of parmesan cheese, plus a little more for the top. In a large mixing bowl, combine the flours and salt. In a smaller mixing bowl (or a liquid measuring cup), combine one cup of the warm water, yeast, and sugar. Allow it to sit for 5-10 minutes, or until the yeast dissolves and begins to bubble. Pour the yeast and water into the flour and stir it with a large wooden spoon until well combined. You will need to add more warm water. Start with another 1/4 cup, and keep adding it by the tablespoon until you have a soft, but still workable dough that forms a ball around your spoon. If you add too much water and the dough is runny or just very wet, stir in a little more flour until it’s forming a ball again. Cover the dough with a sheet of plastic wrap or a kitchen towel and allow it to sit in a warm place for about three hours. It will more than double in this time. At some point during this rise, prepare your bulb of garlic by breaking up the head and removing the paper from all of he cloves. You want all of them to be about the same size, so any large cloves can be cut in half. To Bake the Bread: Preheat your oven to 450°F and place a cast iron dutch oven or bread cooker in it, if you have one. You can definitely make this bread without it, but the dutch oven will help it form a nice, crackly crust. Once it has finished rising, tip the dough out onto a well-floured surface. Sprinkle the top of the dough with more flour, then gently press it out. Place about a third of the garlic cloves across the surface and sprinkle with about half of the cheese, then pull the edges of the dough up around the garlic and pinch them together to seal the garlic and cheese inside. Repeat the pressing and garlic/cheese adding twice more, then your loaf is ready to shape. To shape the loaf, turn it over after pinching together the edges with the last bit of garlic and cheese. The dough should be fairly round with the seams against your surface. Cup your hands around the dough and gently and slowly pull it towards yourself. Give it a quarter turn and repeat until you have gone all of the way around the loaf. This creates tension in the dough, helping it to hold it’s shape. Some of the garlic cloves may pop out, and that’s fine. Just make sure the are still at least partially attached to the bread for baking. Place the loaf on a parchment sheet and allow it to rise for 20-30 minutes. It shouldn’t rise drastically, just puff a bit and become softer. Brush the top with olive oil, sprinkle on a couple of tablespoons of parmesan cheese, and score the top in any pattern you’d like. When you are ready to bake, quickly open the oven and remove the lid to the cast iron dutch oven, if using. Carefully life the bread by the parchment paper and place it in the dutch oven. Replace the lid, close the oven, and bake for 30 minutes. Remove the lid and bake for another 15-20 minutes, or until the crust is a deep golden-brown, and the internal temperature measures 200°F. Remove the bread from the oven and allow to cool for at least 30 minutes before enjoying with some fresh butter or dipping it in olive oil.